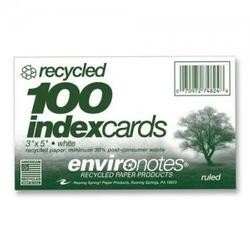 Use these great recycled index cards for studying for tests, organizing recipes, or for so many other things! 100% recycled, 40% post consumer. 100 cards per pack. 3x5. Made in USA by Roaring Spring. It is so important to buy only recycled paper products.